News that the famous, HISTORIC, landmark, neon Tío Pepe sign, synonymous with Madrid’s Puerta del Sol as much as the “Oso y el Madroño” statue, won’t return to the address Puerta del Sol, 1, causes nothing but discomfort in one’s heart and mind. “How can they do this?” we ask. “Tío Pepe”, the sombrero-wearing, guitar-toting bottle, went on “holiday” in April 2011, reportedly only for a few months while the building was being renovated for the new tenants, the new APPLE STORE. It seems the Jerez-based bodega González Byass wasn’t aware, until now, their contract with the building’s owners, Mexican family Díaz Estrada, wouldn’t be renewing their contract at the end of this month. Bet that was a shock! The neon Uncle Pepe sign was hoisted atop the building in 1936 and hasn’t been removed for any reason since – although not for lack of trying. Several Madrid mayors have tried to “knock down” Puerta del Sol’s favorite Uncle, but failed for lack of funds and public outcry. Just before the sign was lowered in April 2011 there was a flood of articles about how it would be restored to its former glory, down for “just a few months while completing the building’s renovation“. “The sign goes with the building,” we were told, and all parties were in agreement. As it turns out, there allegedly was no intention to return the sign and, allegedly, the city and APPLE new about it. Again, ALLEGEDLY. The story goes, now, that this, allegedly, was the agreement between the building’s owner and the new tenants from the beginning. You’ve got to wonder, if we’d all known this before the sign was removed, what kind of “movement” would’ve taken place to deter it. I mean, let’s face it, it is just an advertisement by a rich Spanish (so far) company. Should we care? Does its removal change our quality of living in some way? 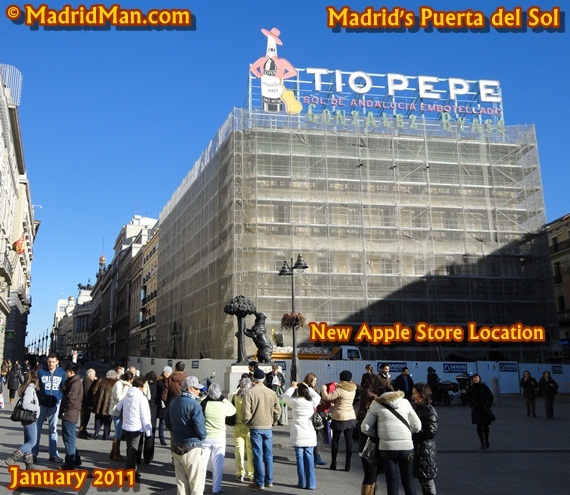 Apple knows good-and-well that the famous Tío Pepe sign has been viewed by billions of eyes from direct visitors to the Puerta del Sol, in video clips, travel photos, websites, and countless postcards. Remove Tío Pepe, put a big bitten APPLE atop that building and you achieve any company’s perfect marketing scenario. And WE, the public, do the advertising for them! How could it get any better for APPLE? You may share your, support, rejection, comments, concerns and memories here on this blog posting as well as on the Puerta del Sol Facebook page at http://Facebook.com/PuertaDelSolMadrid and also on MadridMan’s ALL SPAIN Message Board in this thread. This entry was posted in About Spain, Money and tagged Apple Store, Diaz Estrada, Gonzalez Byass, landmark, Madrid, Plaza, protected, Puerta del Sol, sign, sign removal, Tio Pepe. Bookmark the permalink. A view from my hostal , some 7 years ago . What?! No more Tio Pepe? 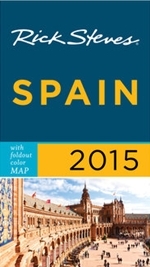 We’ll be in Madrid in a few weeks – what a disappointment! It IS a shame, for sure. 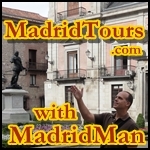 HOPEFULLY on your NEXT visit to Madrid Tío Pepe will be “holding down” one of the OTHER buildings in the Puerta del Sol!